What is the fundamental purpose of a university education? Most of us would probably agree that we aim to provide our students with the ability to ‘think things through’. Asked to define this phrase, we might list a set of skills that include some or all of the following: logical and critical thinking, clear writing, numeracy, and some understanding of the challenges involved in assessing of evidence. In the UK it has been taken for granted that because we punch above our weight in terms of the number of ‘world class’ universities, it follows that the education they offer is also world class. Drawing on US data, Roksa and Arum (2011) raise doubts about the value of a college education. When their sample of students, enrolled at a wide range of colleges, took the Collegiate Learning Assessment (CLA) (a standardised test) the results made depressing reading: “a high proportion of students are progressing through higher education today without measurable gains in critical thinking, analytical reasoning, and writing skills as assessed by the CLA”. Like most research in higher education, the primary focus of Roksa and Arum is the behaviour of students. However, their findings hint at the possibility of complementarities between how much time we spend teaching and how much time our students spend studying. How much teaching do university students receive? To investigate the teaching side of the relationship, we undertook (what we believe to be) the most detailed examination of the teaching arrangements at UK universities since the Robbins Report in 1963. In our paper, we use the rights contained in the Freedom of Information Act, to collect data from 67 universities about the teaching of economics, history, and physics (Huxley et al. 2017). 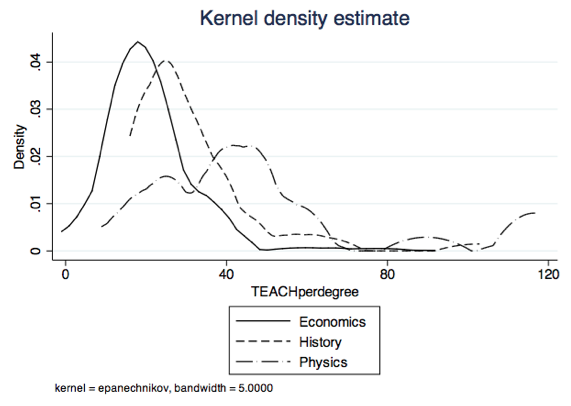 There was large variation across disciplines: on average students studying economics or history received less than half the teaching received by physics students. There was even larger variation within disciplines; for example, an economics student in the top decile receives almost five times as much teaching as an economics student in the bottom decile. There was no relationship between how much a student paid in tuition fees and how much teaching they received. Very little of the variation in TEACH can be explained by factors such as the fee, research reputation, or endowment; accident and history appear to determine the outcome. The crucial difference is that in our data, there is almost no variation in revenue per student. The implications are as follows. Since there is no agreement on the characteristics of an undergraduate education, cost and revenue cannot be determined. This means that governments can set the level of funding per student at almost any level they choose. What we have shown is that even where revenue is constant, how much teaching students receive can vary by at least as much as the variation in revenue per student. The degrees of freedom in the system are even larger than Bowen suggested. The policy implications of these findings are sobering. Price signals in higher education are weak to the point of being nonexistent. This gives rise to enormous scope for cross subsidy. These cross subsidies can arise between subjects, and between teaching and research. The interests of students get forgotten when competitive pressures are absent and governments prioritise the number of world class universities. Arum, R, and J Roksa (2011), Academically adrift: Limited learning on college campuses, University of Chicago Press. Bowen, H R (1980), The Costs of Higher Education: How Much Do Colleges and Universities Spend per Student and How Much Should They Spend?, Taylor & Francis. Huxley, G, J Mayo, M W Peacey and M Richardson (2017), “Class Size at University”, Fiscal Studies. Robbins, L (1963), The Robbins Report on Higher Education, Report of the UK Government Committee on Higher Education.